Background Quantifying relative harm caused by inhaling the aerosol emissions of vapourised nicotine products compared with smoking combustible tobacco is an important issue for public health. Methods The cancer potencies of various nicotine-delivering aerosols are modelled using published chemical analyses of emissions and their associated inhalation unit risks. Potencies are compared using a conversion procedure for expressing smoke and e-cigarette vapours in common units. Lifetime cancer risks are calculated from potencies using daily consumption estimates. Results The aerosols form a spectrum of cancer potencies spanning five orders of magnitude from uncontaminated air to tobacco smoke. E-cigarette emissions span most of this range with the preponderance of products having potencies<1% of tobacco smoke and falling within two orders of magnitude of a medicinal nicotine inhaler; however, a small minority have much higher potencies. These high-risk results tend to be associated with high levels of carbonyls generated when excessive power is delivered to the atomiser coil. Samples of a prototype heat-not-burn device have lower cancer potencies than tobacco smoke by at least one order of magnitude, but higher potencies than most e-cigarettes. Mean lifetime risks decline in the sequence: combustible cigarettes >> heat-not-burn >> e-cigarettes (normal power)≥nicotine inhaler. Conclusions Optimal combinations of device settings, liquid formulation and vaping behaviour normally result in e-cigarette emissions with much less carcinogenic potency than tobacco smoke, notwithstanding there are circumstances in which the cancer risks of e-cigarette emissions can escalate, sometimes substantially. These circumstances are usually avoidable when the causes are known. Both cigarette smoke and VNP emissions (or ‘vapour’) are aerosol mixtures of particulates and droplets in gaseous matrices, but each is generated by a different process from different precursors within different temperature ranges. Nicotine is not a carcinogen but VNPs transfer a burden of known carcinogens in the aerosol. Assessing the relative harmfulness of different VNPs requires meaningful indicators of harm. Common approaches include the analysis of biomarkers in bodily fluids, in vivo and in vitro toxicity studies, and evaluating the numbers of individual chemicals that exceed a specified threshold of safety.6–10 The health risks of smoking were established half a century ago by epidemiological evidence of associated morbidity and mortality but it may be several years before such approaches can definitively assess the harm of VNPs.11 Meanwhile, public health advice depends on quantitative chemical and toxicological approaches to model VNP risks. This study aims to (1) derive a procedure that overcomes the problem of incompatible emissions data sets, (2) reduce the information on carcinogenic risk represented by multiple individual compounds to a single latent variable (potency) that reflects the cancer risk and (3) calculate cancer potencies from published emissions data and compare various nicotine product risks by factoring in exposure estimates. Compounds from mainstream smoke analyses are typically reported in mass units (mg, µg, ng as appropriate) per cigarette. Fewer analyses of hazardous compounds in VNPs have been published and the units reported vary widely, usually as mass of compound per volume of vapour (often as µg per N puffs where N ranges from 1 to several hundred puffs of fixed volume). A few studies report mass units of toxicant/volume of precursor e-liquid but these are not included in this study. represents the undiluted smoke volume and k is the machine smoking protocol for the ith sample (cigarette). For the ISO protocol S =35 mL and D ranges from 0 to 1, for MDPH S =45 mL and D is half the filter ventilation, and for the HCI protocol S =55 mL and D =0. .14 The graph shows strong correlation between undiluted smoke volume V* and nicotine concentration per cigarette (r2=0.93, p<0.01) with a linear regression intercept close to the origin. Similar co-linearity of V* over the major carcinogens under consideration provides a means of expressing smoke carcinogens as concentrations in a form independent of machine smoking protocol. (µg/cigarette) is the mass per cigarette of the jth carcinogen in the ith product that has been machine-smoked using protocol k.
), usually reported as mass/volume concentrations, only need conversion to µg/mL, as appropriate. is the cancer potency of smoke or vapour relative to average tobacco smoke and is the dimensionless parameter used to discuss relative potency below. The same procedure is applied to HnB tobacco sticks. Concentrations of several major carcinogens in cigarette smoke and in VNP vapour were obtained from studies of cigarettes,14 27 28 a prototype HnB device29 and EC products, ranging from early-generation disposables through second-generation clearomisers and cartomisers to third-generation mods and tanks.7 30–37 EC coil resistance and battery voltage were collated where reported. This compilation has many gaps where some carcinogens were not analysed. After removing duplicates across studies and omitting non-steady-state emissions (where stated), the resulting data set contained 93 analyses divided into three subsets.34 The Goniewicz subset is the benchmark with 12 EC samples analysed for seven carcinogens including carbonyls, volatile organic compounds (VOCs), nitrosamines and metals.7 The remaining 81 analyses include concentrations for some organic compounds (formaldehyde, acetaldehyde and occasionally VOCs) and thus yield minimum estimates of potency, of which 32 involved coil heating experiments applying multiple powers to the same liquid in the same device (variable power subset). The remainder (n=48) are termed the organics-only subset. Cancer potencies were computed for the data sets using equations 3 and 4 following conversion into compatible units of concentrations (equations 1 and 2) and matched with unit risks for cancer. The calculation sequence is summarised in online supplementary table S1. Average concentrations, unit risks and cancer potencies for various nicotine products are given in table 1, and the potencies of individual samples are graphically presented in figure 1. All results are normalised to the average value for tobacco smoke and plotting the results on a logarithmic axis creates a relative cancer potency spectrum for the various nicotine-bearing aerosols. Relative cancer potency modelled for common forms of nicotine delivery. Potency is the aggregate estimated using equations 3 and 4 and normalised to average tobacco smoke with cancer risk set to 1.0 (equation 5). Each circle or ellipse on the graph represents the emission from a single sample or experiment in the peer reviewed literature. In all, emissions from 14 peer-reviewed studies are summarised in the diagram (see text for data sources). MS, mainstream smoke. Smoke collected under the ISO protocol and converted to undiluted smoke volume V* has essentially the same potency as that collected under HCI (figure 1). Without factoring for filter ventilation, the ISO samples would be widely dispersed ranging down to much lower apparent cancer potencies for the most ventilated brands. HCI and ISO tobacco smoke have the same distributions after applying the V* conversion (figure 1) which indicates that raw undiluted tobacco smoke occupies a narrow band on the potency spectrum regardless of protocol and defines the upper boundary of cancer potencies among common nicotine products in high-income countries. Ambient air, essentially a non-hazardous aerosol, defines the lower end of the cancer potency spectrum, clustering around a carcinogenic potency of slightly less than 10-5 that of tobacco smoke. The potency of the nicotine inhaler is about 10−4 that of tobacco smoke (figure 1), with metals contributing >70% of its carcinogenic potency. The cancer potencies of EC are more difficult to define and are highly dispersed compared with cigarettes. 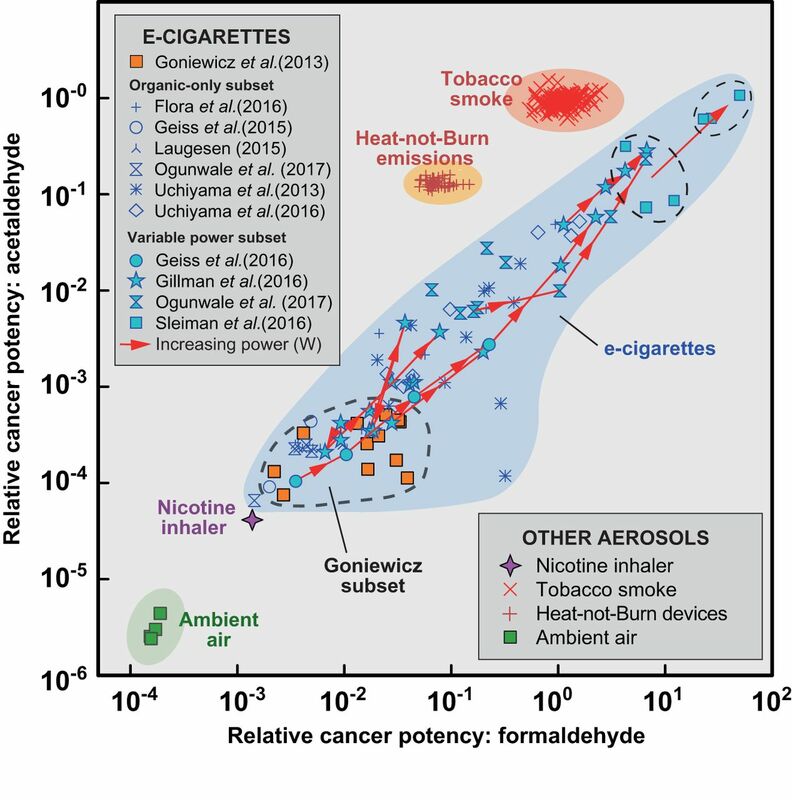 The Goniewicz subset, which analyses the majority of anticipated carcinogens in EC vapour, clusters around ~10−3 of the potency of tobacco smoke (figure 1). The preponderance of potencies in the organics-only and variable power subsets also falls in this range, although higher levels of carbonyls found in these two subsets extend the range as far as the potency of tobacco smoke. 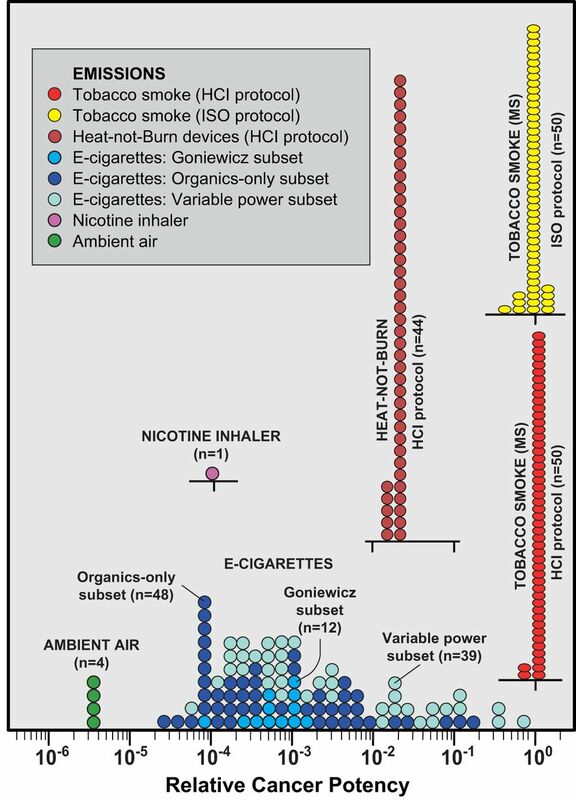 The cancer potencies of the HnB prototype device that heated various tobacco blends lie between one and two orders of magnitude less than tobacco smoke but higher than the preponderance of EC emissions (figure 1). Equations 6 and 7 estimate the lifetime cancer risks from daily exposure (table 1). The values for ECs in this table are based on a compilation of first-generation and second-generation devices because most third-generation tanks and mods were used for variable voltage experiments. The average for EC includes the Goniewicz subset supplemented by carbonyl analyses from those members of the organic-only subset for which the device generation could be identified. The potency ratio relative to tobacco smoke for the average of these ECs is 1.8×10–3 while HnB had an order of magnitude higher relative potency at 2.1×10−2. The excess cancer risk for a lifetime of smoking 15 cigarettes a day is 2.4×10−2, 5.7×10−4 for inhaling 15 HnB sticks, 9.5×10–5 for vaping 30 L from ECs at normal power and 8.9×10–6 for inhaling 30 L from the nicotine inhaler (table 1). Compared with a nicotine inhaler, the relative risks are 11 for EC, 64 for HnB and ~2700 for cigarettes, whereas compared with cigarettes the relative risks are 0.024 for HnB, 0.004 for EC and 0.0004 for the nicotine inhaler (table 1). The highest-ranking carcinogens in table 1 for cigarettes are 1,3-butadiene and acrylonitrile, accounting for more than three-quarters of the cancer potency, whereas for HnB, acetaldehyde is the dominant carcinogen, which, along with 1,3-butadiene, accounts for almost three-quarters of the aerosol’s potency. For ECs, only the Goniewicz subset includes nitrosamines and metals as well as carbonyls and VOCs. The highest ranked carcinogens in this subset are cadmium and formaldehyde. Even very small levels of cadmium can have a major effect given its extremely high unit risk (table 1) but cadmium is not detected in all samples and in others it is present in concentrations very close to blank level.7 Formaldehyde and acetaldehyde account for >95% of the contributions of organic compounds to cancer potencies in this EC subset. Relative cancer potencies of formaldehyde and acetaldehyde in vapour from e-cigarettes compared with tobacco smoke, heat-not-burn devices, a nicotine inhaler and ambient air. Values are normalised to the mean potency of the same carcinogens in tobacco smoke. Data sources for e-cigarettes are identified with different symbols (see key for sources). The variable power subset includes all devices used in experiments to create vapour at more than one atomiser power (watts). Solid red lines connect the potencies of emissions for the same device run at different powers with arrows indicating the direction of increasing power. The lines show that the cancer potencies from the same device can vary by more than two orders of magnitude for both formaldehyde and acetaldehyde. The accuracy of emissions modelling can be evaluated by comparing the lifetime risk model for tobacco smoking with epidemiological data for smoking-related mortality. An early application of this model to tobacco smoke predicted an excess risk of 1.6×10−2 for a daily consumption of 20 cigarettes measured with the ISO protocol.26 This differed from the estimated excess cancer risk of 7.9×10−2 derived from mortality data for smokers in the USA in 1995.14 Applying the same model to the Centers for Disease Control tobacco smoke data set measured with the HCI protocol weighted by current OEHHA unit risk values doubles the estimated risk to 3.3×10−2 averaged over 48 cigarette products (SD 3.5×10−3) for the same daily consumption rate. This closer agreement is largely due to the use of the HCI machine smoking protocol for emissions, suggesting that these independent estimates reflect the same fundamental causes of mortality. A simple aggregation does not account for enhancement by synergystic interactions between components (but there may also be antagonistic interactions). A few synergystic effects are well known, often between tobacco smoke and particles such as asbestos and silica, but these are largely restricted to industrial exposure (although silica particles have been recognised in EC vapour).43 44 Unit risk values are not available for all known carcinogens and are thus not involved in the aggregation leading to underestimation. Furthermore, only carcinogens formally classified by the IARC are included. Although cigarette smoke has been thoroughly investigated for toxicants over several decades, EC have not received the same level of scrutiny and some carcinogens are possibly yet to be identified, although these ‘missing carcinogens’ would need to be present in high concentrations and/or have high unit risks to make a noticeable difference to EC potency and risk. Other sources of uncertainties are differences in unit risks between environmental protection authorities, and the assumption that risk is linearly proportional to dose with no threshold. VNP and cigarette emissions have been compared in this study using carcinogen concentrations, whereas normalisation to unit nicotine levels is sometimes preferred as an estimate of human exposure.49 Nicotine has an unprotonated (free-base) and two protonated forms, unprotonated nicotine being of greatest concern in terms of blood transfer. The fraction of total nicotine in free-base form varies widely in both tobacco smoke and EC vapour largely as a function of pH.50 51 Whether free-base nicotine could be a useful proxy for exposure in tobacco-based aerosols requires further research as does the relationship between the concentrations of the various nicotine forms and exposure to toxicants in EC emissions. Biomarkers for 1,3-butadiene and acrylonitrile in urine samples from EC-only users indicate levels similar to nicotine replacement therapy users, in contrast to the high levels found in smokers.10 Biomarkers for the same compounds declined rapidly in smokers switching to ECs at rates similar to abstinence from smoking over 5 days.52 Neither compound is normally detectable in EC vapour yet both have been shown above to account collectively for more than three-quarters of the cancer potency of tobacco smoke.53 This close correlation between reduced emissions in EC vapours and their associated biomarkers for two of the most important carcinogens in tobacco smoke supports the use of emissions in estimating potency and risk. Data from experiments on one HnB device indicate cancer potencies and risks lower than tobacco smoke by more than one order of magnitude greater than the preponderance of ECs operating under normal conditions (table 1). This finding is provisional as it is based on a single prototype design from a single manufacturer. Unit risk values (table 1) indicate a potentially major role for metals even at low concentrations. ECs are typically metallic devices, not least the atomiser which is normally a metallic coil usually made of nichrome (NiCr alloy) or kanthal (FeCrAl alloy). Other metallic components can include electrical conductors, crimps, connectors, solder, cartridges and structural features of the device, many of which show some evidence of corrosion over time in prefilled devices. Several papers document elevated levels of metals in liquids and occasionally the aerosol but no consistency is yet evident in emissions.7 44 45 57 The lack of metals data for samples other than the Goniewicz subset means that some cancer potency values for ECs in this study may be underestimated. Even less is known about the speciation of metals in EC vapour despite the importance of different valence states and molecular speciation in tobacco smoke toxicity.58 59 More detailed study of metals, especially Ni, Cr and Pb and their speciation in a wider of range of products, may lead to new perspectives on the cancer potential of metals in EC vapours. The conclusions of this study refer only to the chemical risks of cancer and do not account for any other carcinogenic effects such as those attributable to small particle sizes. There is some evidence that the large differentials found here between the cancer potencies of most ECs and those of tobacco smoke may be less for other medical conditions involving the cardiovascular and respiratory systems.37 Future research should address these gaps. The cancer potency calculation for VNPs was applied to a range of devices covering different generations purchased in different countries but no claim is made that these samples are representative of all products in the current marketplace. As the VNP market continues to expand and diversify, a better understanding of the origins and aerosol transfer of carbonyls and metals is required to achieve EC emissions with consistently low carcinogenic potency. Such understanding may prompt calls for constraints on device design and e-liquid formulations but it is likely that significant reduction in cancer risk could also be achieved by effective advice to EC users on generic aspects of devices, coil selection and refill liquids as well as vaping behaviour and product manipulation. Emissions from vapourised nicotine products (VNP) including e-cigarettes contain carcinogens but generally in lower concentrations than tobacco smoke. Each carcinogen contributes quantifiably to the overall cancer potency and risk. Users and policymakers need quantitative evidence on the relative risks of cancer from the use of VNPs compared with smoking tobacco. Previous studies considered the individual carcinogens in an emission; here a method is developed that models the aggregate cancer potencies of all measured carcinogens and overcomes incompatibilities in data reporting conventions enabling direct comparison of the potencies and risks of tobacco smoke with VNP emissions. Cancer potencies span five orders of magnitude creating a spectrum ranging from uncontaminated air through VNPs to tobacco smoke. Most e-cigarette analyses indicate cancer potencies <1% that of tobacco smoke and <10% that of a heat-not-burn prototype, although a minority of analyses indicate higher potencies. Highly carcinogenic emissions from e-cigarettes are avoidable, being due largely to user choice of device setting, liquid formulation and vaping behaviour, highlighting a need for increased user awareness and personal involvement in reducing risk. ASH. Use of electronic cigarettes (vapourisers) among adults in great Britain. Fact Sheet: Action on Smoking and Health (ASH), 2016:1–13. Anon. The health consequences of smoking – 50 years of progress: a report of the Surgeon General. Atlanta, USA: U.S. Department of Health and Human Services, Centers for Disease Control and Prevention, National Center for Chronic Disease Prevention and Health Promotion, Office on Smoking and Health, 2014:944. ISO. Routine analytical cigarette-smoking machine: definitions and standard conditions, 2012:25. USEPA. Basic information about the Integrated Risk Information System, 2017. USEPA. An Overview of Methods for EPA’s National-Scale Air Toxics Assessment: US Environmental Protection Agency. Office of Air Quality, Planning, and Standards 2011. NIH. The Economics of tobacco and tobacco control. Bethesda, MD: U.S and Geneva, CH: National Cancer Institute Tobacco Control Monograph and Department of Health and Human Services, National Institutes of Health, National Cancer Institute World Health Organization, 2016. ONS. Adult smoking habits in the UK: 2016. Office for National Statistics, 2017:18.
. Nicotine and toxicant yield ratings of electronic cigarette brands in New Zealand. N Z Med J 2015;128:77–82.
. Public Health Risk Assessment for Human Exposure to Chemicals. Environmental Pollution: Springer, 2002.
. The health risks of using e-cigarettes. RIVM Letter report, 2015:47. The changing nicotine products landscape: time to outlaw sales of combustible tobacco products?